Fildgor Orcthane, formerly known as Fildgor Strong-Prince, was a Nord prince born to Queen Mabjaarn Flame-Hair of Eastern Skyrim. He was the twin brother of Jorunn the Skald-Prince, and Princess Nurnhilde was their elder sister. Fildgor was famous for leading the Stormfist Brigade, which gained legendary reputation as fearless adventurers. He led the Brigade against the Akaviri Invasion of 2E 572, and lay a claim to the throne after Mabjaarn's and Nurnhilde's deaths. However, Jorunn opposed his claim, and the two dueled to determine the new High King. Fildgor lost and was exiled. Fildgor made a pilgrimage to western Skyrim to see the land and people, befriending members of the Stormfist clan along the way. When he was to perform his coming-of-age trials, the clan members joined him and formed the Stormfist Brigade, with Fildgor as their de-facto leader, despite not being a clan member by birth. The Brigade became renowned for its legendary adventures, slaying monsters and bandits and looting treasures. During the Akaviri Invasion, Fildgor led the Stormfist Brigade as they fought their way to Windhelm and joined forces with Mabjaarn and Nurnhilde's army. Mabjaarn and Nurnhilde were slain during the battle, leaving the throne to the brothers. Fildgor claimed the throne first, though Jorunn challenged his claim as he did not believe that Fildgor would be a good king. To stave off civil war, the two fought in single combat and Fildgor lost, resulting in his exile by Jorunn. He was rumored to have fled to Daggerfall Covenant territory. 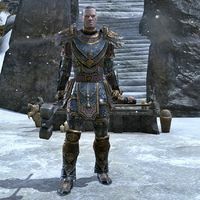 Needs info about his appearance in ESO, his related quests, and how he tried to take the throne from Jorunn. To reclaim the throne from Jorunn, he and his supporters rallied an army of Orcs. He took on the name Fildgor Orcthane. In 2E 582, he returned to Skyrim and attempted to overthrow his brother. Fildgor entered Sovngarde through Skuldafn to steal Nurnhilde's essence and convince the Crown of Freydis to accept him.. This page was last modified on 21 October 2018, at 08:09.